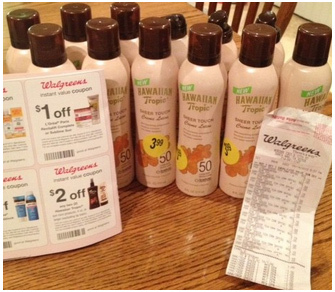 This week at Walgreens (until 5/19), Hawaiian Tropic sunscreens are B1G1 50% off. They are priced at $3.99, but are ringing up at $3.19. If you have the right coupons, you can score a bunch for free! = FREE + $1.22 overage! NOTE: You'll need a few filler items to cover the overage. NOTE 2: If you don't have the coupon from the newspaper, you can get a $1/1 coupon here. @anon, I found them sitting on top of the cosmetics counter. Hope that helps!